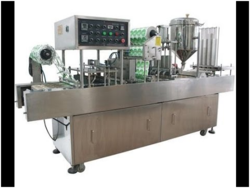 Offering you a complete choice of products which include automatic water cup filling sealing machine, automatic cup glass rinsing filling & sealing machine, automatic water cup filling machine machine, cup filling & sealing machine for water yogurt, automatic water cup glass rinsing filling & sealing machine and automatic drink water cup filling machine. APPLICATIONS: This Machine is widely used in various kinds of plastic cup for WASHING, liquid filling and sealing. It can automatically finish the process of WASHING, filling, sealing, cutting, sterilizing in ultraviolet radiation and falling cup etc .IN addition, it can be customized that according to your special requirements. Weight : 350 Kg Approx. Mechanical Systems Model No Mscrf-95 for Cups Automatic Washing fill-seal-cut machine is widely used infilling and sealing various kinds of plastic cups for liquid. It can automatically finish the processes of WASHING, filling, sealing, film cutting, code printing, sterilizing in ultraviolet radiation and falling cup etc. In addition, it can be customized according to your special requirement. We can offer machine with 2 , 4 , 6 and 8 head machines Pneumatic Type SOLENOID filling system can also be provided. Mechanical Systems Model No Mscrf-95 4 Head Cups Automatic Washing fill-seal-cut machine is widely used infilling and sealing various kinds of plastic cups for liquid. It can automatically finish the processes of WASHING, filling, sealing, film cutting, code printing, sterilizing in ultraviolet radiation and falling cup etc. In addition, it can be customized according to your special requirement. We can offer machine with 2 , 4 , 6 and 8 head machines Pneumatic Type SOLENOID filling system can also be provided. Mechanical Systems Model No Mscrf-95 for Cups Automatic Washing fill-seal-cut machine is widely used infilling and sealing various kinds of plastic cups for liquid. It can automatically finish the processes of WASHING, filling, sealing, film cutting, code printing, sterilizing in ultraviolet radiation and falling cup etc. In addition, it can be customized according to your special requirement. We can offer machine with 2 , 4 , 6 and 8 head machines Pneumatic Type Solenoid filling system can also be provided.